Jamal Khashoggi - a Washington Post contributor and prominent critic of Saudi Arabian Crown Prince Mohammad Bin Salman - may have been murdered by Saudi royalty. If foul play is uncovered, the Middle-Eastern monarchy might have no choice but to pay greater respect to human rights. Khashoggi, who was born in Saudi Arabia but resides in the US, hasn’t been seen since he entered the Saudi consulate in Istanbul. A Turkish paper claims his Apple Watch captured his "interrogation, torture and killing”. Saudi Arabian officials wouldn’t flinch at murdering an outspoken journalist, as sanctioned punishments for breaking the monarchy’s strict laws include public floggings, amputation, beheading and crucifixion of beheaded bodies. The incident comes at an awkward time for the crown prince. In his medium-term plan for the nation, Vision 2030, he proposes a transformation of the kingdom into a global economic powerhouse. The regime would ‘encourage our major corporations to expand across borders and take their rightful place in global markets’. 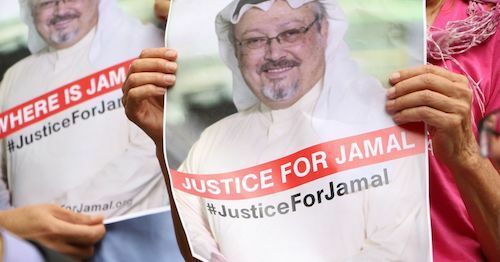 However, accusations of murdering a Washington Post contributor will make Western governments wary of aligning themselves with him, risking a loss of international protection from enemies and jeopardising his country’s entry into the international fold. US President Donald Trump, breaking from his past praise of dictators, has threatened "severe punishment" if Saudi Arabia is found to have killed Khashoggi. Nonetheless, Trump remains committed to funding Saudi Arabia’s endless war in Yemen, claiming US jobs could be lost if he stops. The conflict has destroyed medical areas and other non-military infrastructure, and taken the lives of 5,295 civilians, according to the UN Human Rights Watch. In addition to direct casualties, the Saudi coalition starved countless Yemenis when it blocked the country’s air, land and sea ports in November 2017. Similar to how British authorities reacted to the Skripal poisonings, the Americans could withdraw funding and impose economic sanctions. The reason they haven’t, and why Saudi Arabia has escaped censure time and again, is the country’s political importance in a turbulent part of the world. It serves as a check on the expansive ambitions of Iran and its Shia sympathisers, who have perpetuated several regional conflicts including the war in Syria. If the Saudis allow Syria to fall into the hands of Hezbollah, a militant Shia group, the Iranians would be one step closer to defeating their mortal enemy, Israel. Accordingly, Western authorities have made a tacit agreement to overlook the Saudi royalty’s barbaric actions in exchange for their help in fighting terrorism and keeping the peace, as well as access to their oil. Following Khashoggi’s suspicious disappearance, US officials may feel Saudi Arabia has broken its side of the bargain. The kingdom’s alleged bad behaviour could foil its international and economic ambitions. True, Western governments may only be paying lip service - the $110bn Saudi-US arms deal is still on - and might shy away from meting out meaningful punishment to a useful ally. But Saudi Arabia will undoubtedly face greater scrutiny of its human rights abuses if Khashoggi doesn’t turn up unharmed, potentially forcing the crown prince to add a few humane commitments to his Vision 2030 plan.